What's New: The Oriental Insurance Company Limited has announced the OICL AO Phase 1 Exam Result on its website. Check your result from the useful links below on this page. Introduction: The OICL AO Phase I Exam has been successfully conducted by the Oriental Insurance Company Limited. This exam was carried out on 22nd October 2017. Many candidates have participated in this test and now, they are asking for the OICL Administrative Officer Result 2017 because the shortlisted candidates will appear in the Phase II Examination that will be organized on 18th November 2017. The complete details on this exam result are mentioned below on this page. So, scroll down your page to know more. Topics Furnished on this Page: OICL AO Result 2017, OICL AO Phase 1 Result 2017, OICL Administrative Officer Phase 1 Cut Off Marks, OICL AO Merit List 2017 & OICL AO Phase 2 Exam 2017. About the Exam: The Oriental Insurance Company Ltd is the directing body of Phase 1 & 2 Examination. These exams are the recruitment exams that are being organized for the motive of recruitment of talented candidates on 300 vacancies of Administrative Officers in the department. The job seekers, who were looking for such kind of job, have submitted their applications for these posts. Now, they have taken the Phase-I examination on 22.10.2017. After the declaration of results, the department will give the Phase-II on 18.11.2017. Selection Procedure: There are total three rounds in the selection process for these positions. These rounds are Phase 1 (Preliminary Exam), Phase 2 (Main Examination: Objective & Descriptive Test) and Phase III (Interview). The final selection will be based on the performance of candidates in the main exam (objective test) and interview. The cut off marks will play an important role in the selection of aspirants for the Phase 2 (Main Examination). 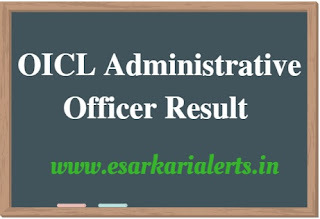 The contenders, who will not obtain marks according to the OICL Administrative Officer Phase 1 Cut Off Marks, will not be able to participate in the next round. The cut off marks of this examination will be publicized by the Oriental Insurance Company Ltd after the declaration of the results. So, stay connected with us to get the latest information on this examination result and cut off marks.